“Baby Monitor All in One” the easiest and most comfortable way to watch your baby. If you have a single Android device, use the Nanny mode to detect noise and to place a call directly to your phone. You can listen and talk to your baby or play your voice recordings and selected songs randomly. If you have two or more Android devices use the Walkie Talkie mode. Simply connect them using Bluetooth or WiFi, listen to the baby from the parents side and control remotely each of its extensive features. 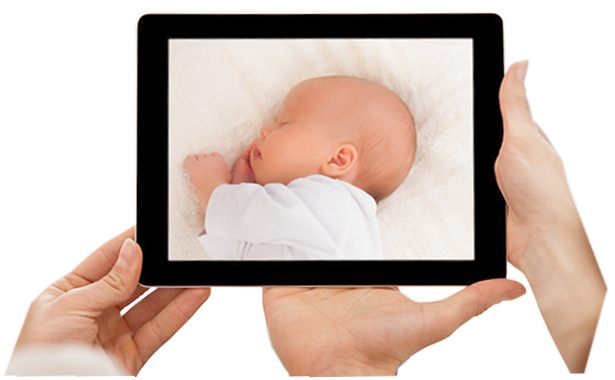 Control your baby through the device camera located in his room. You’ve never had it so easy to see what happens at all times via your tablet or smartphone. You can listen to what is happening in the room and to talk to your baby to calm him down if needed. Your voice is transmitted clearly, accurately and without interferences. Enable/disable the device flashlight located in the room remotely and, without entering, you can calm down your baby or control that everything is going well. If you can’t talk at that time but you know there’s some music or your voice recording that calm your baby, you have a playlist that you can use. Use it automatically when there is noise or when you need. Use your device to read, surf the internet or whatever you like while Baby Monitor All-in-One is watching your baby. If there is a problem with the connection, the baby’s side is running out of battery or just get a call, you will be notified instantly. Connect up to 3 devices to the same baby unit and let more than one person control what is happening in the room. Finally you can work together. 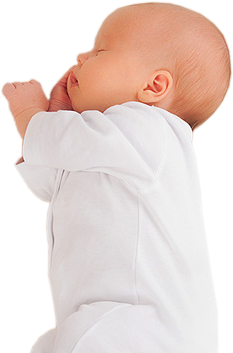 If a noise is coming from the baby, the nanny mode will place a call to the configured alert phone and you will be able to listen and talk to the baby. No matter if the target phone is a mobile or not. This is the one! Tried a few, but this is by far the best one! Bluetooth and Wifi supported. In addition it can pace a call if only one phone is available. 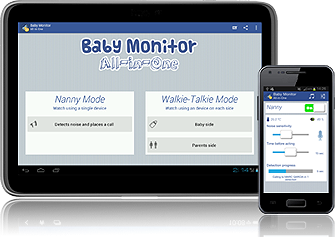 By far the best baby monitor app This app is reliable and is nicest and easiest to use of all the baby monitor apps. I don’t even bother with my actual baby monitor any more as this is better. Great! I have just had my baby and this app is great. I set up an old Android phone at her cot as the baby side and my Android as parent side. I can hear her, talk to her and look at her if I need to.